Norway, a Nordic country in Northern Europe consisting of the western portion of the Scandinavian Peninsula, Jan Mayen and the Arctic archipelago of Svalbard has a total land area of 148,746 square miles and a population of over 4.9 million. 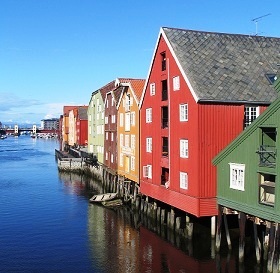 Norway, with its fjords, and awe-inspiring coastal scenery, is the second wealthiest country of the world. Endowed with abundant natural resources, Norway has the highest petroleum deposits outside of the Middle East. Its Scandinavian welfare model provides its people with universal health-care, comprehensive social security and almost free education even at higher levels. Other recognitions include very high standard of living, high environmental performance, highest human development index for many years, most well-functioning and stable country, and the ability to remain among the richest countries for the foreseeable future. It is a mixed economy which is a combination of free market and significant state ownership. Petroleum, hydro-power, fish, timber, minerals, and weapons are the chief contributors to the economy. June through August are the best time to visit Norway for then the days are really long. The fjords, waterfalls and the scenic drives are what enchants the visitors. In fact the Norwegian fjords are touted as the world’s top tourist attraction. The country is also known for its cultural attractions – literature, art, music, and the various fairs and exhibitions. Norwegian architects have taken construction from wood to new heights in that some buildings are worth a tour. Potatoes, cabbage, bread, cheese, and seafood such as salmon, herring, and trout are the main components of a meal. Traditional Norwegian dishes include lutefisk (cured stockfish), smalahove (considered an extreme food, pinnekjøtt (cured lamb), Krotekaker (thin pastry) and farikal. Norway Eyewitness Travel Guides 978-0756661465 $17 A 40-page traveler’s introduction to Norway followed by sections on Oslo, and the rest of Norway by area. Maps and sketches of the most popular attractions are outstanding! Norway Travel Map 978-1553413530 $12 1:650,000 Scale. Includes Inset Street Map of Central Part of Oslo. The first stamp of Norway was a stamp released in 1855 in the Coat of Arms theme in a single blue color design. The stamp (Scott #1) catalogs for around $6.4K mint and around $125 used. Unused copies are very rare and only a few are known to exist. Unused copies with original gum are even rarer and catalog for a lot more. The Coat of Arms theme along with sets portraying King Oscar I were the primary stamp issues of Norway during the period till 1877. Norway released a set of thirteen stamps between 1877 and 1878 showing Post Horn and King Oscar II. The set (Scott #22 to #34) is sought after and catalogs for around $1500 mint and around $320 used. The Post Horn theme reappeared between 1882 and 1893 in another set of eleven stamps. A couple of other sets on the same theme were also issued between 1893 and 1908 and 1893 and 1898. The sets are valuable and catalog for a few hundred dollars. These along with surcharge overprints on some of the Post Horn issues were the primary stamp issues of Norway until 1907. Oscar II was King of Norway from 1872 until 1905 and King of Sweden from 1872 until his death in 1907. King Oscar II was instrumental in the peaceful dissolution of the union between Norway and Sweden in 1905. Norway released a set of three stamps on May 10, 1914 showing the constitutional assembly of 1814. The set (Scott #96 to #98) catalogs for around $60 MNH and around $8 used. It was issued to mark the one-hundredth anniversary of Norway’s Constitution of May 17, 1814. Certain overprints along with issues showing the Lion Rampant symbol and a design showing the Polar Bear and Airplane formed the primary designs of Norwegian stamp issues until 1925. Chief among them were a set of four stamps released between 1922 and 1924 in the Lion Rampant design (Scott #100 to #103) and a set of seven stamps released on April 1, 1925 in the Polar Bear and Airplane design (Scott #104 to #110). The former set catalogs for around $200 MNH and around two dollars for used and the latter set catalogs for around $125 MNH and around the same for used. A set of three stamps released on April 20, 1938 showing local scenes. The set (Scott #181 to #183) catalogs for around $30 MNH and around $4 for used. The designs show reindeer, Borgund Church, and Jolster in Sunnfiord. A set of five stamps released on August 27, 1960 in the Norwegian Shipping Industry theme. The set (Scott #382 to #386) catalogs for around $12 MNH and around $8 used. The designs show Viking Ship, Caravel and Fish, Sailing Ship and Nautical Knot, Freighter and Oil Derricks, and Passenger Ship and Statue of Liberty. Norway is a major shipping nation with one of the world’s largest merchant fleets. A set of three stamps released on April 10, 1984 in the Fishing theme. The set (Scott #836 to #838) catalogs for around $4 MNH and around a dollar for Used. The designs show freshwater fishing, salmon fishing, and ocean fishing. A set of four stamps released on June 11, 1999 in the Millennium theme. The set (Scott #1224 to #1227) catalogs for around $15 MNH and around $3 for used. The designs show Important events from 1000 AD to 1899: family leaving Sejestad Station during the emigration period of the 1800s, Statue of Saint Olav, Christian III Bible of 1550, Christianization Period, King Christian IV Speciedaler, Miners, Union Period from 1380 to 1814, textile factory, paper mill on Aker River, and Oslo from the 1850s industrialization period. The first coins of Norway were minted as early as 995 AD under the Viking King Olaf Tryggvason. The first coins are very rare. Another series was introduced under King Harald Hardrada in the 11th century – pennies with the Triqueta design. In the modern era, Kingdom Standard Coinage (120 Skilling = 1 Speciedaler) debut in 1794 followed by Decimal Coinage (100 Ore = 1 Krone – 30 Skilling) in 1876. Gold Coins debut in 1874 with the issue of a 10 Kroner 0.1296 troy ounce gold coin with low mintage (24K). In recent years, a number of commemorative gold and silver proofs are issued primarily for the numismatic market. Coins $1 and up Common Ores from the 1970s onward in UNC starts around $1. Ores from the 1920s and 1930s in high grades (XF+) start around $10. Commemorative Silver Proofs from the 1970s onward, Proof Sets from the 2000s, etc starts around $50. Low Mintage Commemorative Silver Proofs, Gold Coins, etc go well into the 100s and 1000s. Paper Money $5 and up Common UNC Kroners starts around $5. Recent High Value UNCs starts around $15. Large Notes from the 1910s in VF, Rare WWII Banknotes in high grades (XF+), etc start around $50. Rare Dates, Low Serial Numbers, Early Large Notes in high grades (XF+), etc go into the 100s. Typical souvenir representative of Norway are the goat and reindeer skin, wooden horses, hand-knitted sweaters, gloves and jewelry. Antiques $10 and up Vintage maps start around $10. Vintage Compasses, Sterling Silver Enamel David Andersen Spoons, Viking Ship Open Salt Cellars, start around $50 and go into the 100s. Art $5 and up Vintage local scenes prints and posters start around $5. Prints from works by Synklar Gubbransdalen, Mona Learum start around $30. Rosemailing Prayer Plates, Carved Wood Trolls, etc start around $50 and go into the 100s. Original works by Atsushi Kikuchi, Knut Yran, Alexander Cameroon, Ernst Lorenz, etc start in the 100s and go well into the 1000s. Miscellaneous Collectibles $3 and up Patches, stickers, etc start around $3. Original vintage local scenes photos start around $15. Vintage Pewters, Candle Holders, Vases etc start around $30. Vintage Hammerfest , Helle Safari, Viking Burial Swords, etc knifes start around $100.